Out of room for hard drives? Are your hard drives too noisy? If you said "Yes" to either of those questions, then the Scythe Anti-Vibration HDD Stabilizer 2 is for you. 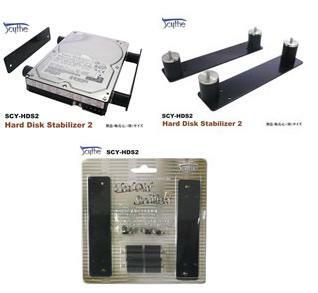 The HDD Stabilizer 2 allows you to mount a 3.5" hard drive in a 5.25" bay, and it even silences it for you at the same time! *Note: The HDD Silencer 2 will not fit cases with non-standard 5.25" drive bay screw holes or cases with screwless mounting mechanisms.